The Jaguars get 25 points by way of seven three-pointers from sophomore Edy Essien. 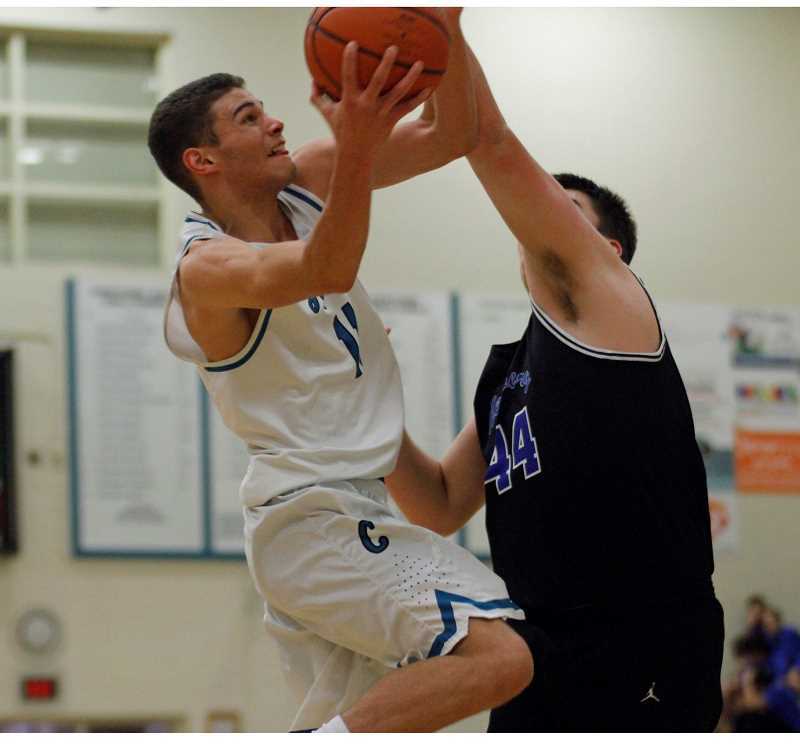 Following a nonleague slate that ended with a 6-6 record, including a stretch in which Century lost four of five games, the Jaguars started the league schedule off right, defeating the Newberg Tigers 56-52, Tuesday night, Jan. 8, at Century High School. 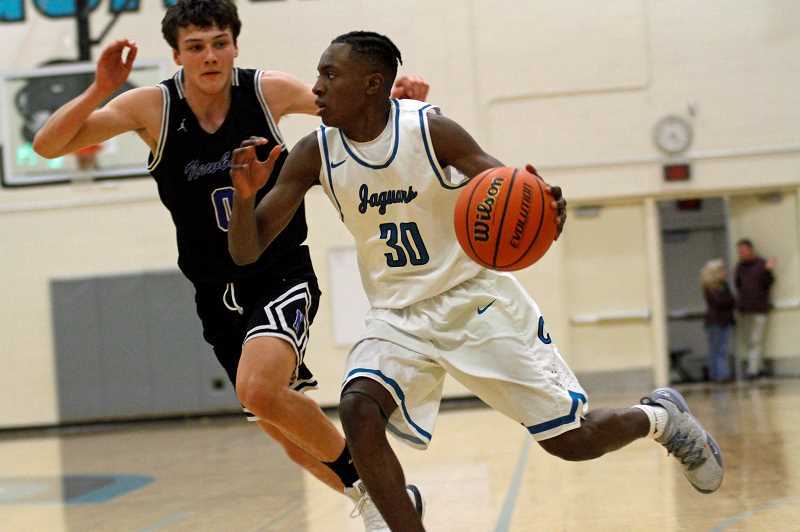 Led by the hot shooting of guard Edy Essien and the gritty, hard-nosed play of forward Chance Sparks, the Jags separated late from a see-saw battle that was anyone's game up until the contest's final minute. "That's about as well as we've played all year," said Century head coach Scott Kellar. "I was proud of how we fought back and showed some resiliency. There were times when they'd make a five or six point run, but we'd hit some timely shots, then it was nice to be able to dictate how things went at the end." Essien, a 5-foot-9 sophomore, finished with 25 points, including seven three-pointers, five of which came in the first half. Kellar said Essien had struggled in a recent loss to Mountainside, and as a result was in the gym at 6:30 a.m. the morning of the Newberg game working on his shot. Apparently his extra time worked, as the second-year varsity player repeatedly hit shots from behind the arc, seemingly gaining confidence with every successful basket. "You don't always get an immediate reward from that type of hard work, so it was nice to see Edy get those results tonight," Kellar said. "No one works harder on their game. I was happy for him." Newberg built an early lead behind both the inside and outside play of 6-foot-6 post Kyle Kruse. The senior scored seven first quarter points, including a 22-foot three-pointer, but Essien matched Kruse's effort with a trifecta of three-pointers to give Century a 14-13 lead at the end of one. The Tigers quickly tied the game, then took a 21-19 lead before a Jaguars timeout led to back-to-back Essien threes to again put Century on top. Newberg however answered again, this time with consecutive baskets from senior Alex Jaczko. But with time ticking away in the first half, the Jags' Kyle Hamnes took a long outlet pass and hit a running, banked-in three-pointer as time expired to put Century ahead 28-26 at the break. Newberg scored two quick baskets to start the third quarter, but Essien started the second half where he left the first, hitting a deep three to put the Jaguars back up 31-30. Kruse did most of the work for the Tigers over the next five minutes, but it was Sparks' basket late in the quarter that seemed to change the game. The junior, who also stars for the Jaguars' football team, dug-out a rebound amongst two bigger Newberg players and scored, leading to a stretch that saw him tally eight of Century's next 10 points, allowing the Jags to build a six point lead and provide the home team with a little breathing room with just four minutes to play. "Chance is our hustler and go-to guy inside," said Kellar. "What he gives up in size, he makes up with quickness and athletic ability. He seems to make two or three real hustle plays every game. He's our energizer." Sparks didn't necessarily agree with his coach's assessment of his role, but prefers to see his contribution as ever-evolving based on what his team needs from him at the time. "I don't really believe in roles," Sparks said. "I do whatever the team needs me to do to succeed, and I guess because I play football that toughness is kind of my mentality." Despite Sparks' "spark," Newberg didn't quit, closing within two on a Jaczko three with 2:00 left on the clock. Essien however, took his outside game in, scoring on a drive to the basket with 1:20 to go, then a series of Jaguar free throws by Sparks, Jospin Mugisha and Ikin Chan iced the game at the end. "We haven't been in a tight spot like we were at the end tonight, so I was proud of how we handled that," Kellar said. "Newberg is a team that most feel will be in the top half of the league, so hopefully we can build on this." Sparks echoed his coach's sentiments regarding their solid performance, while at the same time pointing out that they had plenty of room for improvement. Nonetheless, it was a good win and the forward hoped it was the beginning of a lot more as the league season progresses. "We're definitely excited," said Sparks. "I know a lot of people picked us to finish seventh in the league and that's put a chip on our shoulder. I think as good as we're playing now, we can do a lot better, and Coach Kellar is going to get us there." Century next hosts McMinnville Friday, Jan. 11, at 5:45 p.m. at Century High School.